As each year, the new leader’s team for Division B has been elected and appointed and this an exciting moment where new ideas, new goals and new projects have been discussed and approved. I see Division B as a complete one where great experienced speakers and leaders are part of, and thanks to their involvement and performances young speakers and leaders can get the inspiration and courage to dare more, to go out of their comfort zone. It was exactly what happened with me in 2014, when I started participating at Division B events, I realized how far I could go thanks to the positive support of other experienced Toastmasters. 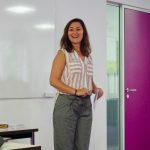 The connection created at a Toastmaster Club is like a family where trust and caring are fundamental because members depend on each other; it goes beyond a school team because the supportive spirit goes over the competition. What we end up achieving in Toastmasters goes far beyond our plans, because of the unexpected support and encouragement of people we meet, and the personal enrichment is indescribable. I believe that in the end, this is the reason that keeps us motivated and determined in pursuing towards the success, everything we do. I warmly invite all Club Officers to visualize your personal growth that the role offers to you, before planning your club benefits, as only when the win-win balance is set you and your Club really win. And say “YES”, to many opportunities that other Toastmasters will be offering to you during this year, because you will be amazed where the ship will lead you. The friendly and supportive environment that reigns on the healthy Clubs will also guide our work that we will be doing, in collaboration with you, this year. I look forward to seeing you soon, around. Previous Previous post: How a bunch of Ghentroverts kicked off their journey to Rebirth in Athens….